What’s the deal with every winter being the ‘worst winter yet’?! While the temperatures will drop, we think its high time we embrace the Canadian way and enjoy it. 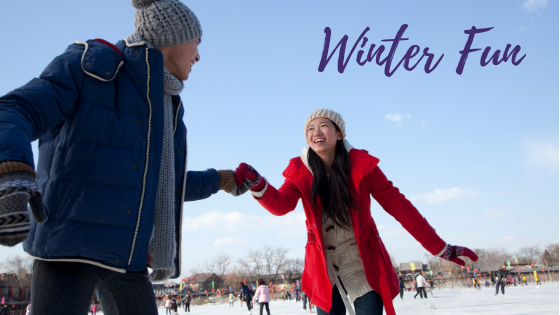 Here are some winter activities that’ll help work up a sweat while letting you enjoy the season. Lace up your skates and set out for an enjoyable glide through the 250 metre looped trail’s natural setting at the Richmond Green Skate Trail! The trees surrounding the trail are native to the area and many were transplanted from other areas of the park during the park’s redesign. With the twinkling lights in the trees and music in the air, this is an outdoor winter tradition you’ll want to experience! The trail is open daily for ice skating between 10 a.m. and 10 p.m. from December to March (weather permitting). It is also open for inline skating from April 1 to November 1. For further information, please call 905-771-5490 or visit them online. The Newmarket Ice Lounge at the Newmarket Riverwalk Commons (200 Doug Duncan Drive), is the coolest place in town with modern outdoor lounge furniture. This is a great place to take a break from skating on the outdoor Tim Hortons Skating & Water Feature or simply chill with your friends and family this winter! The Newmarket Ice Lounge is open from November 30, 2018 – February, 2019. Surprise Saturday’s are returning to the Newmarket Ice Lounge sponsored by Jay Miller Real Estate on selected Saturdays. Click here for more information and updates. Love tubing? Get over to the Georgina ROC for an awesome time going downhill! You can also sign up for snowshoeing with a cup of warm apple cider! If you lived in York Region throughout your elementary school days, you probably ended up at the same place we all did during the winter, the Uplands Golf and Ski Club! Relive your memories and experience fun on the slopes. Skiing and snowboarding will give you thrills and keep the chills away! Our small towns and villages are second to none. Shopping, dining, romance and family fun are all conveniently located on our main streets! Stroll through Main Street Newmarket and make an appointment at the relaxing and rejuvenating Sanctuary Day Spa, or stop in for a bowl of hot ramen at the newly opened HopBop Noodle Shop. Walk through Unionville and get a taste of the charm and beauty-don’t forget to visit Ambiyan, Tripadvisors top restaurant in Unionville for 2018! Markham Main street has come alive! Gather your friends and make it a night of food and drinks at the many local restaurants. From February 1st to the 13th you can Win a Night of Romance just by shopping on Main Street! Take a walk through Downtown Whitchurch-Stouffville and catch a show at 19 on the Park! Winter is the perfect time to get into the mood, nothing better than warming up next to your sweetheart on a cold day! Experience romance in the region by visiting The Briars Resort and Spa. The Briars’ captivating marriage of traditional country inn warmth with extensive resort facilities provides such a sense of a private retreat that our guests consider us “Another World”, just an hour from Toronto and perfect for every season. Not only do we have the best summer attractions in our region, we’re in the business of family fun all year round. Get indoors this winter and have a great time with your entire family. The options of fun are endless: If you’re looking for fun and learning, head over to Reptilia and get a taste of how the creepy-crawlies live. Reptilia is a state of the art 25,000 square foot facility complete with large exhibits showcasing hundreds of different reptiles and amphibians. Watch the Cast at work in the nursery, our food preparation area and the venomous workshop! Each day there are a variety of opportunities to interact with animals and learn from the exceptional Cast Members during shows, tours and animal feedings! With four reptile feedings every day, free live theatre shows or zoo keeper tours and a chance to interact with the reptiles and the Zoo Cast, Reptilia is a destination worth visiting. Reptilia’s zoo is the first of its kind and it adds another destination to Vaughan’s already growing list of attractions. Enjoy winter indoors or outdoors, we’re here to help!